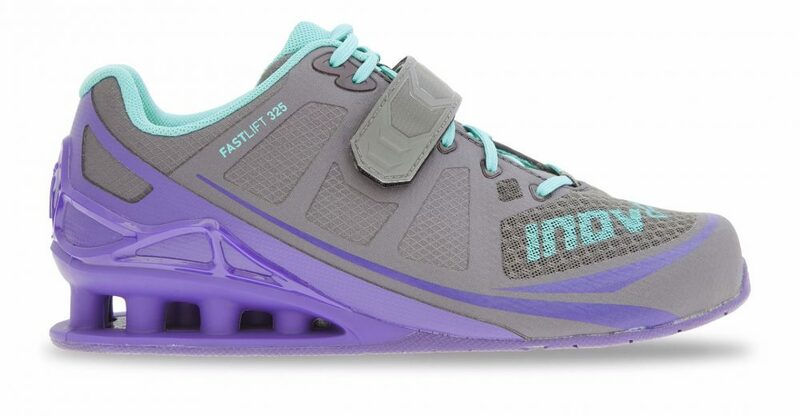 I’ve never trained in lifting shoes before and have been rather jealous of a very shiny pair a trainer at work is always wearing, so when the opportunity came up to try out Inov8’s Fastlift 325 weightlifting shoes, I was incredibly excited. The neutral-fit lifting shoe includes patented PowerTruss heel tubing for a stable but lightweight base and a wide toe box, a max-traction outside and natural flex grooves in the forefoot. The shoe promises “security, flexibility and comfort”. So I popped them on and hit the olympic platform in the gym to test them out for myself. The first thing I notice about the 325s is how light they are. I expected chunky lifting shoes to be heavy, but I can jump around in these with ease. I generally consider myself to have pretty good squat mobility, so I wasn’t sure how I felt about having an elevated heel to squat in. But I take it all back – it was lush. Front squats in the shoes felt strong, stable and deep. That extra little heel allowed me to sit low in the squat without rolling my hips under. I worked through a 5×5 front squat set and I was very impressed by the overall support the shoe provided. For clean and jerks, I found I could stamp around in them much easier than regular trainers. I felt far more stable than usual. They have a very flexible toe with a really sturdy heel. They use a combo of laces and velcro, which keeps them snug and secure. When doing a walking lunge to box jump superset, I found the shoes worked well. The flexible toe allowed me to jump better than I expected and they’re so light it barely felt like I was wearing shoes at all. They fit great (I’m a size 4 in regular shoes and these are size 4s too), feel great and work great. I like the functionality of the shoes, which work with the big lifts, with walking lunges, with box jumps. I think crossfitters will especially love this shoe as they can be used for the WOD, without needing to change. Get a pair for £130, inov-8.com.